Hey there! My name's Brianna or Harli, either works! I go by she/her pronouns and I'm in a relationship with my lovely girlfriend (who I'm trying to get to join this game). I do art, animation, and lots of these online collectible games. I accept random PMs and dex trades, just ask! <3 If you want to find out more about me, you can read my info page on my neocities website over here. I tend to mass click people on my VIP list, so if you want semi-daily mass clicks, pm me! Good luck out there! Sprite credit- Pokestadium, and also the official games. Free-to-use pixel star divider made by Miemie-chan3 on Deviantart. Other pokemon sprites are from the PQ Wiki. 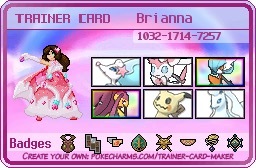 Click the trainer card to go to where you can make your own! Just a little tab showing off some of the sprite edits I've done. Get your own here!